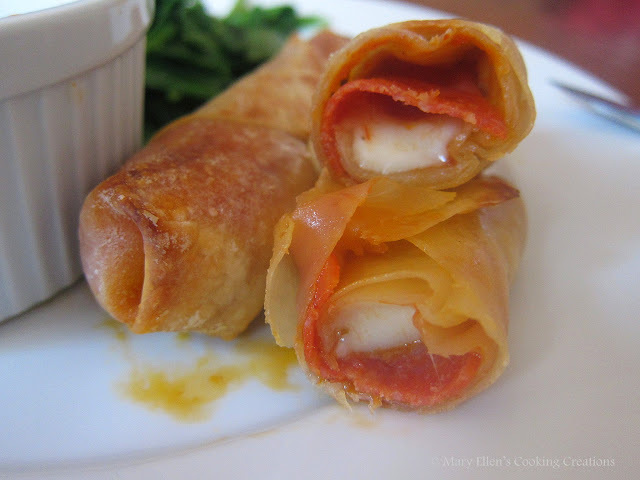 A few weeks ago I made Baked Egg Rolls that were filled with ground pork and lots of veggies. My little one and I had so much fun making them together that I wanted to do something with the remaining egg roll wrappers. I checked out my fridge and spotted the package of string cheese I just bought as well as a package of sliced pepperoni - instant inspiration! These pepperoni pizza rolls were crunchy, gooey, fun. 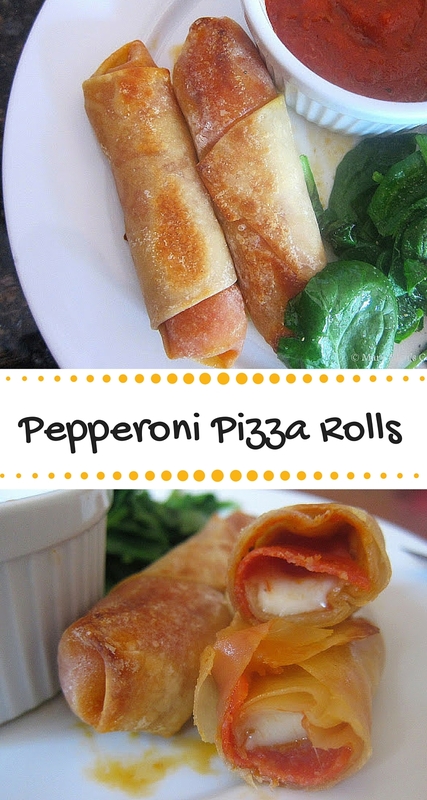 They would make a great appetizer for a party or game day. 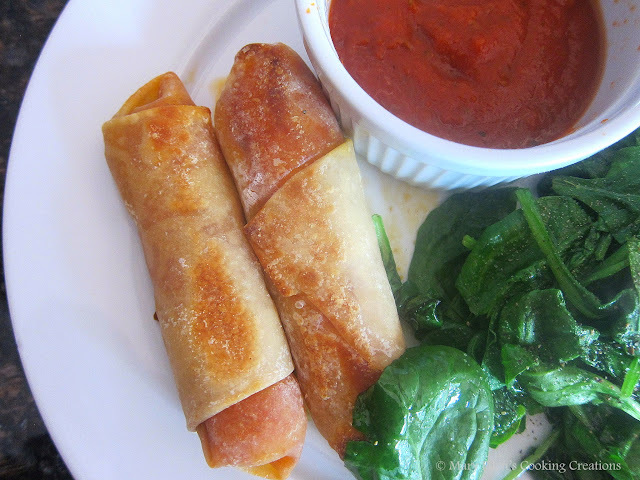 We enjoyed them as dinner - I rounded out the meal by serving them with some sautéed baby spinach. One note: when working with eggrolls, be sure to keep the wrappers covered with a wet paper towel as they are waiting to be used. Once I would finish rolling one, I'd cover it with another wet paper towel. You don't want the wrappers to dry out and crack before you cook them. Lay one wrapper on a cutting board (lay it so a point is facing you). Spoon a small amount of sauce just below the center of the wrapper, spooning from side to side. Put one of the halves of string cheese on top of the pepperoni. Roll the rolls - Spray a baking sheet with cooking spray. Lay a wrapper flat on the sheet (like a diamond - pointed end facing you) and spoon a small amount of sauce onto the bottom third of the wrapper. Add three slices of pepperoni somewhat overlapping from side to side, and then top with one of the halves of string cheese. Fold the bottom of the wrapper over the ingredients and fold in the sides. Roll it once and fold in the sides again. Roll it until sealed (about 1.5 more turns) and place seam side down for baking. Continue rolling all of the rolls until done and then spray them with cooking spray. Bake for 10-15 minutes until golden brown. Note: when I made the pork egg rolls I flipped them halfway through cooking. I didn't flip these until 3/4 of the way through cooking since the cheese wanted to ooze out. I put the broiler on at the end to brown up the tops.